Twin-Twin Transfusion Syndrome (TTTS) is a serious condition that occurs in approximately 10 to 15 percent of pregnancies with identical twins that share one placenta, also called a monochorionic-diamniotic twin pregnancy. Blood vessel connections within the placenta allow the fetuses to share blood supply and can cause an imbalance in the fetal blood volumes. As a result of unequal blood flow, one twin (the donor twin) pumps blood to the other twin (recipient twin). The condition can cause the recipient twin to make too much urine, which may enlarge the bladder, produce too much amniotic fluid and in advanced stages, cause heart failure. The donor twin will then have decreased blood volume, low levels of amniotic fluid and urine, and a smaller bladder. The majority of twins with TTTS who have appropriate treatment during pregnancy will survive and the majority of survivors will be normal and healthy. 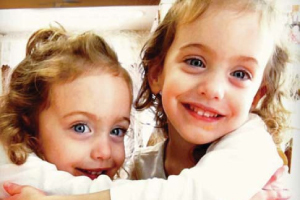 If untreated, the survival rate for twins with severe TTTS is less than 5 percent. TTTS is often found during a routine prenatal ultrasound. The ultrasound will reveal whether the fetuses are identical and whether they are monochorionic-diamniotic (mo-di) twins. Defined by two amniotic sacs sharing the same placenta, monochorionic-diamniotic twins are at risk for TTTS. The severity of TTTS can be assessed by determining the amount of amniotic fluid in both sacs, filling of bladder of the donor twin, and testing blood flow through various blood vessels in both fetuses. A fetal echocardiogram may also be performed for further evaluation of the fetal hearts. A fetal echocardiogram may also be performed for further evaluation of the fetal hearts. Additionally, our team may utilize fetal echocardiography, to further assess the progression and severity of TTTS. Texas Children’s Fetal Center provides diagnostic imaging and treatment recommendations on the same day. Depending on the severity of TTTS, fetal intervention can be scheduled immediately when indicated. Initially, the patient will undergo an ultrasound, and if necessary, an MRI and fetal echocardiogram to confirm the initial diagnosis and stage of TTTS. Then, the patient and family will meet with their care team to discuss a comprehensive plan of care. The team consists of a fetal therapy and surgery physicians, a nurse coordinator and a fetal cardiologist. During this meeting, the individualized treatment plan for each patient is discussed and options are presented, including whether surgical fetal intervention is necessary. Selective fetoscopic laser photocoagulation is the standard of care for severe TTTS. It is a minimally invasive surgical procedure that uses a small camera (fetoscope) to locate abnormal blood vessel connections in the placenta and disconnect (cauterize) them using a laser. SFLP is the preferred method of treatment for severe cases of twin-twin transfusion syndrome. The procedure prevents the exchange of blood between fetuses, often halting the progression of TTTS and normalizing the blood flow. Thorough evaluation will be conducted before deciding if fetoscopic laser photocoagulation is an appropriate option. Generally, the fetus should be between 16 and 26 weeks gestation with no other significant anomalies, and the mother should be healthy. SFLP is an inpatient procedure. The mother is given IV sedation, local anesthesia and in some cases general anesthesia may be necessary depending on the location of the placenta. Medicine to prevent labor is administered. A fetal surgeon will then make a small incision in the mother’s abdomen and insert a small instrument into the uterus. The fetoscope is then passed through the instrument to examine and map the blood vessel connections on the surface of the placenta shared by the twins. This image is viewed on a large screen and ultrasound is used to continuously monitor the fetal heart rates. The laser is used to seal the connections between the blood vessels and disconnect them permanently. After sealing the blood vessels between the twins, our surgeons laser a line between the connections in order to coagulate even smaller vessels from one side to the other. This process is called solomonization. The surgeon will then drain the excess amniotic fluid (amnioreduction) before completing the procedure. This illustration on the left shows the laser disconnecting the vessels. The illustration on the right shows the solomonization technique. After the procedure, the mother is given medicine to prevent uterine contractions. Although each case is different, most patients remain in the hospital for two to three days. Ultrasound and in some cases fetal echocardiography are performed 48 to 72 hours after surgery to evaluate the condition of the fetuses. Although every procedure has risks, the chance of serious maternal complications with this procedure are rare. Possible complications include premature labor, premature rupture of membranes, infection and harm to the fetus. During the evaluation, the physicians at Texas Children’s Fetal Center will provide a detailed review of the babies' condition and treatment options. Upon discharge, patients are able to return home to the referring maternal-fetal medicine specialist and/or OB/GYN for the remainder of their pregnancy. Some patients may decide to stay with Texas Children’s Fetal Center if they are local, or may relocate closer to time of delivery in order to deliver at Texas Children’s Pavilion for Women. For those that choose to deliver at the Pavilion for Women, the nurse coordinators will provide assistance with obtaining prenatal records and scheduling all necessary visits. Read our medical algorithm for TTTS and TTTS follow-up. When Julie Burroughs went in for an ultrasound of her twins at 16 weeks, she was shocked to learn that they were not growing properly due to twin-twin transfusion syndrome (TTTS). Please call (832) 822-2229 or 1-877-FetalRx (338-2579) toll-free to discuss a specific case or diagnosis with a physician from Texas Children’s Fetal Center. Available 24/7. Immediate appointments often are available.